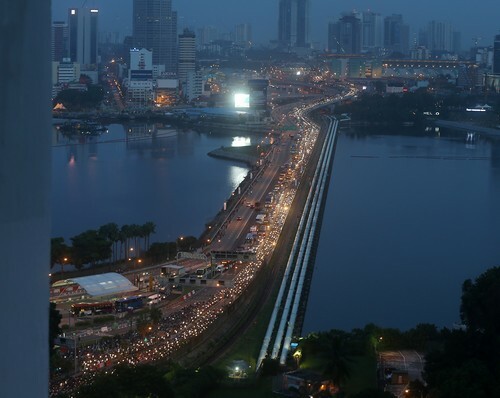 ISKANDAR PUTERI - An average of 295,731 people use the two land crossings between Malaysia and Singapore daily. 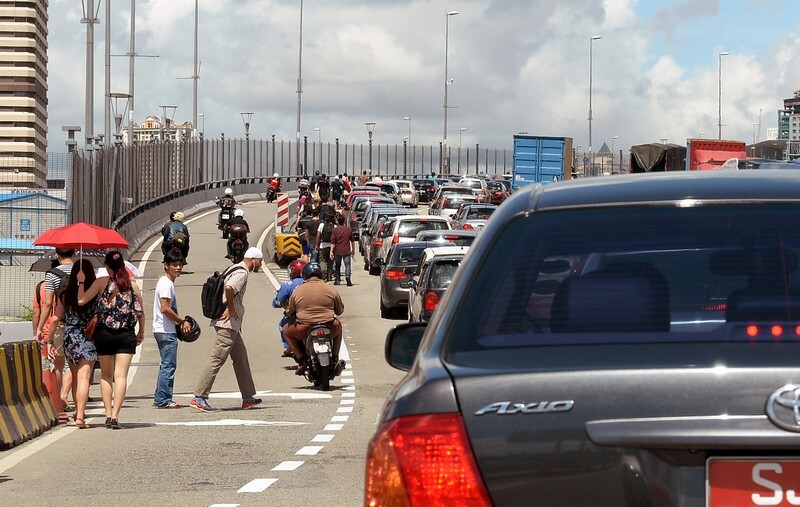 State Tourism, Trade and Consumerism Committee chairman Datuk Tee Siew Kiong said Immigration Department records showed that some 107.9 million people used the Johor Causeway and Second Link last year. 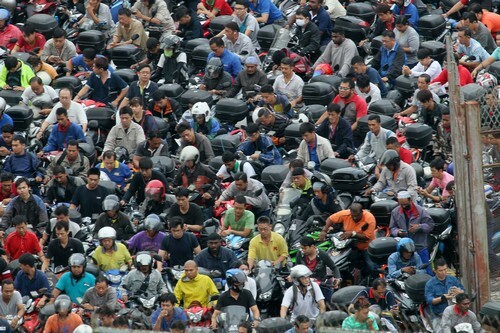 "This did not include the ones travelling on motorcycles, cars, vans, lorries and buses. "These two crossings are among the busiest in the world," he said, adding that several strategies had been put in place to overcome congestion at both links. 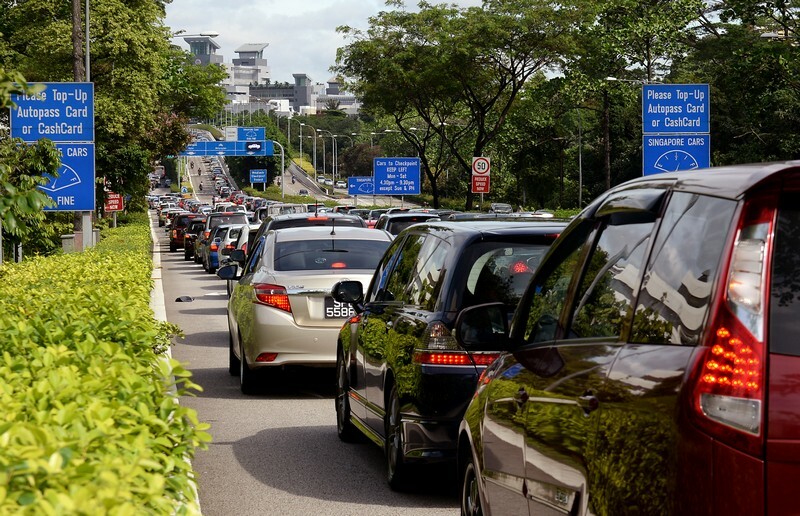 Long queues of people and vehicles could be seen at the Woodlands Checkpoint and the Johor Bahru Customs, Immigration and Quarantine (CIQ) Complex across the border, as thousands of Malaysians headed home for Chinese New Year. 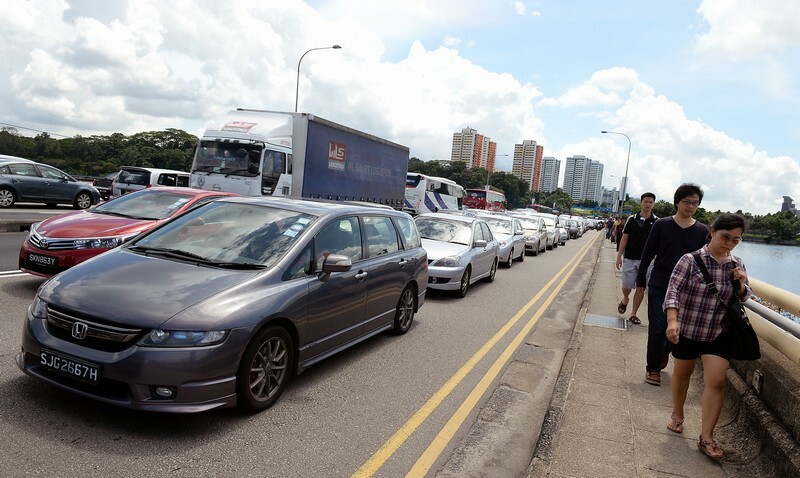 Long queues of cars on the roads leading into Woodlands Checkpoint had formed by early Saturday morning, Lianhe Wanbao reported. 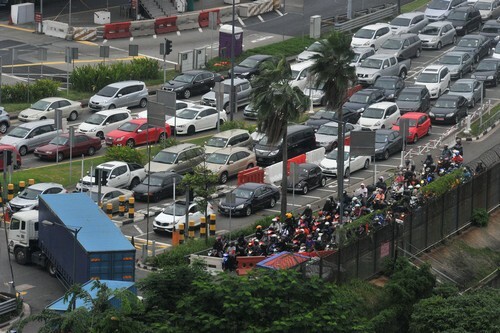 A reader told the Chinese evening daily that the vehicle queues stretched for several kilometres all the way up to the Johor Bahru CIQ complex, with an estimated two or three hours needed to pass both checkpoints. Some pedestrians reported being stuck in queues for close to two hours. At the departure halls at both checkpoints, cries of "do not jump the queue" could be heard. 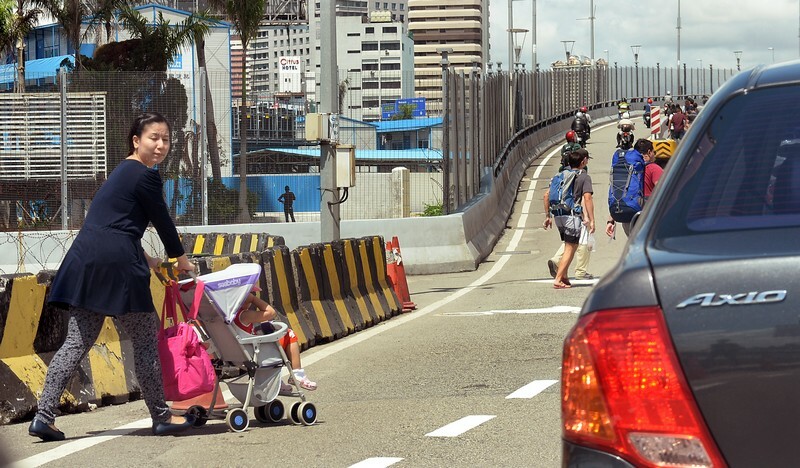 Pedestrian traffic across the Causeway seemed to return to normal on Friday afternoon after massive jams the day before. 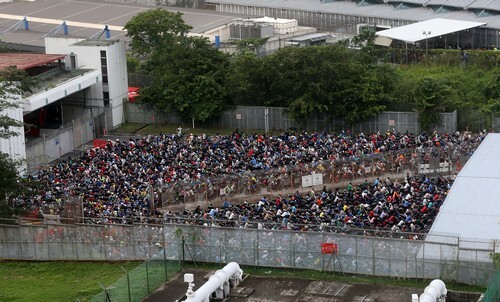 According to The Straits Times, those who were heading into Singapore said they did not experience long waiting and processing times. 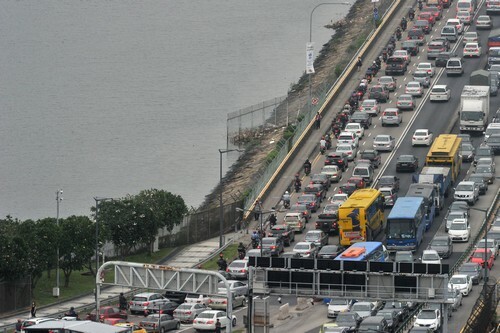 Heavy vehicular traffic, however, continued for another day and Land Transport Authority traffic cameras showed bumper-to-bumper traffic in both directions of Causeway at about 4.30pm. 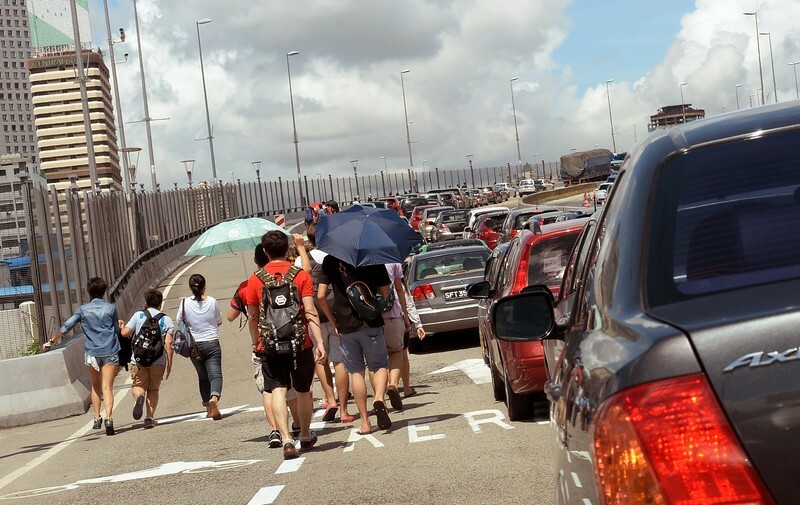 On Thursday morning, several people who were fed up with the traffic jams decided to cross the Causeway by foot instead. 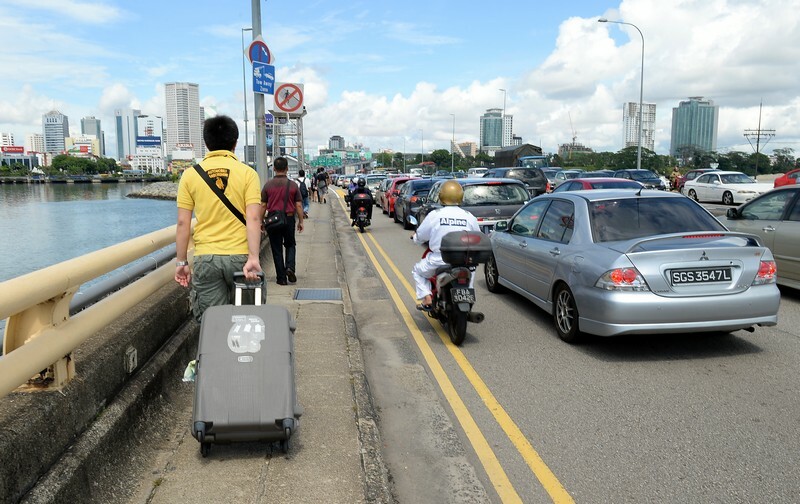 Snaking queues were seen on both vehicle lanes and pedestrian lanes on the Causeway. 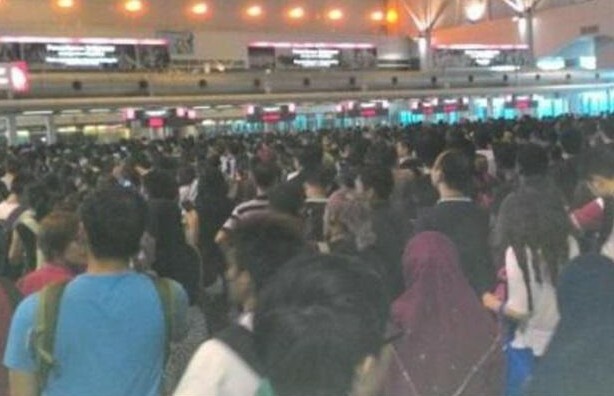 According to Shin Min Daily News, pedestrians from Malaysia had to wait for more than an hour to enter Singapore. It was also reported that some gave up and turned back while others considered swimming across. 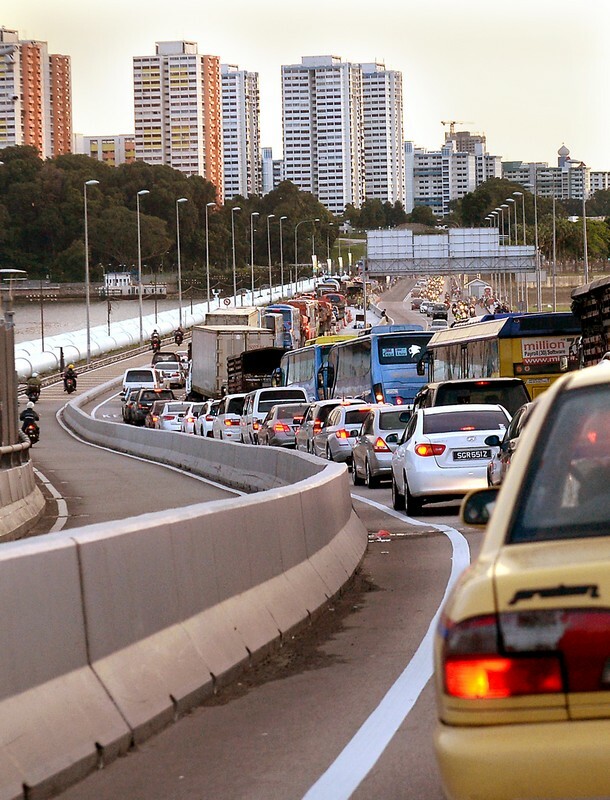 Traffic in Johor Baru came to a standstill yesterday morning as close to 120,000 vehicles - triple the usual traffic - headed into Singapore via the Bangunan Sultan Iskandar Customs, Immi­gration and Quarantine Complex (CIQ) in view of the holiday season. 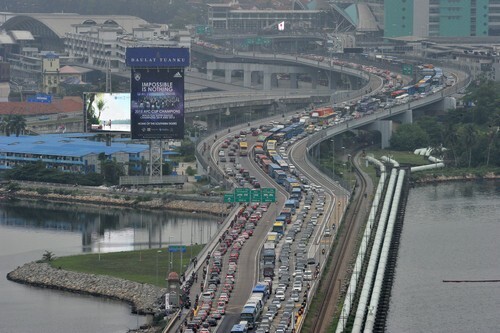 Those working in the city (Johor Baru) were also caught in a massive jam as some motorists made illegal U-turns in a desperate attempt to escape congestion on the Eastern Dispersal Link (EDL) leading to the CIQ near the Permas exit here. 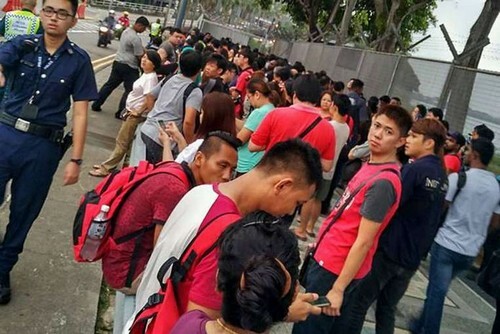 Malaysians took to Facebook to vent their frustration after being stuck at Singapore Customs for hours. 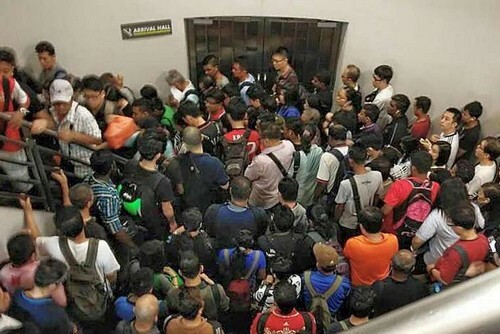 Some claimed that the pedestrian walkway to enter the island republic was closed despite the exodus of Malaysians starting at around 4am. 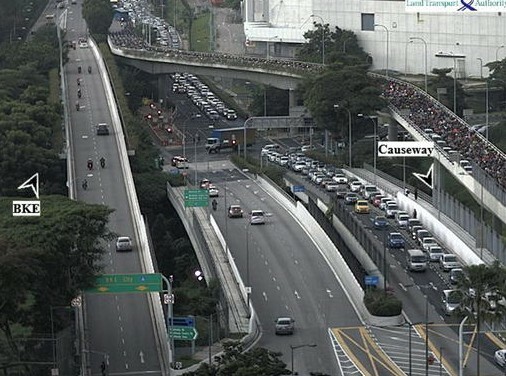 Andrew Vijenthern Subra­ma­niam said the pedestrian gates and lorry lanes were only opened after 6am, causing a major human and traffic jam towards Singapore. 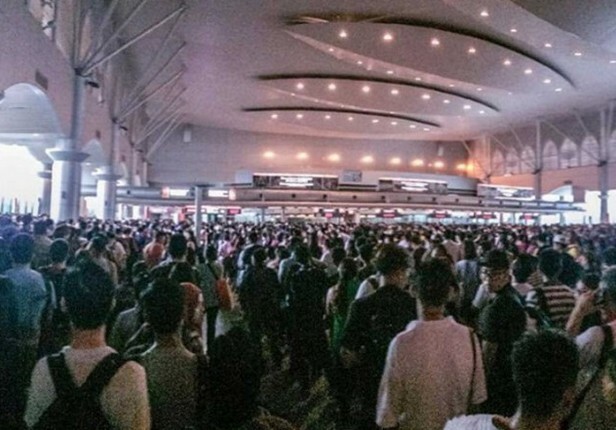 User Gloria Lai alleged that many who used the pedestrian walkway tried to enter Singapore and were forced to turn back after hours of waiting for the gates to open. 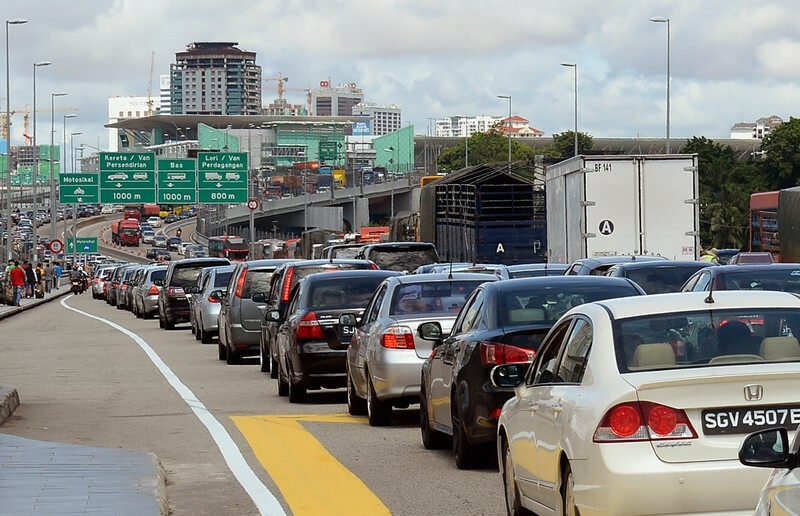 Johor Indian Business Association president P. Sivakumar said the congestion also affected traffic heading towards Permas and Johor Baru for work. Among the steps was beefing up the Immigration Department with another 468 personnel by June this year to man the counters in both places. 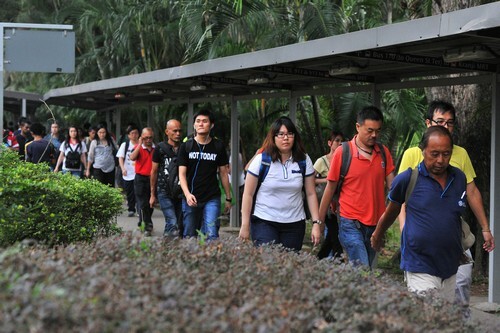 "We are also ensuring that all 351 booths are manned, especially during peak hours," Tee said, adding that this was achieved after a freeze on leave by immigration personnel. Tee said the state government hoped to increase the frequency of the train service to Singapore and have additional bus services from Iskandar Puteri to Boon Lay and Jurong East on the island republic. There were also plans to have more direct flights from Senai International Airport so that locals would not need to travel to Singapore to take flights. 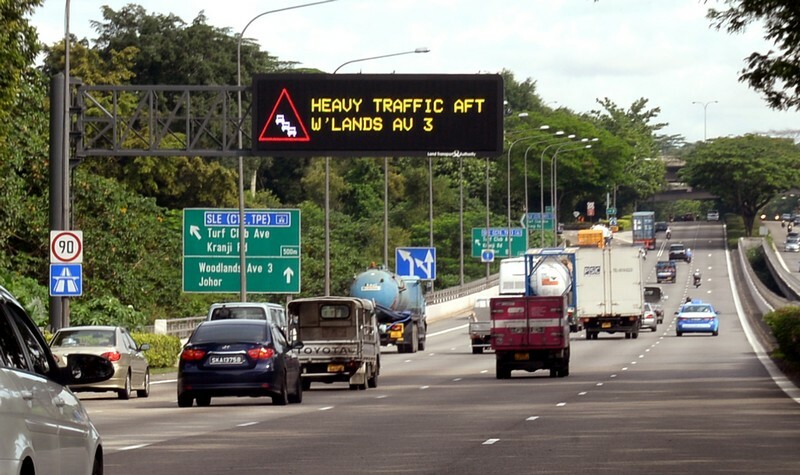 It would also be good if the police could set up a mobile station on the Causeway, and later at the Second Link, to monitor and control the traffic, he said in his winding-up speech. He hoped the Federal Government would allow tourists in tour buses to enter the country without having to bring down their luggage. On the development of Senai airport, he said there was an increase in travellers who used the facility, from 2.325 million in 2014 to 2.581 million last year. The airport handles direct flights to six South-East Asian countries. "Next month, AirAsia will be flying directly to Guangzhou, China," he said, adding that they would be eyeing more direct flights to India, Myanmar and the Philippines. 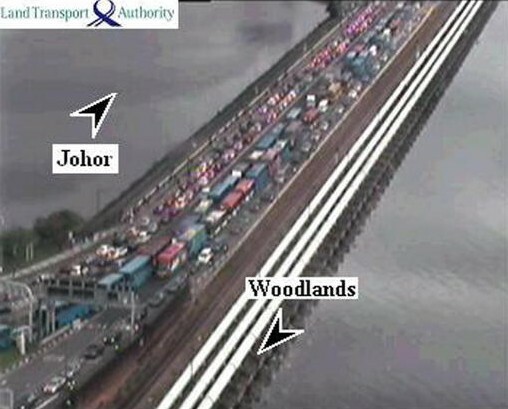 To beat the perennial jam on Johor Causeway, many Malaysians have come up with a risky solution. They take the short cut along the rail line from Lido Beach along the Straits of Johor to avoid the traffic jam, and then climb up to the Causeway and walk their way to the other end. They later walk along the rail line beside the Causeway until the point nearest to the Causeway road surface, where they will climb up to the Causeway from the water pipes. 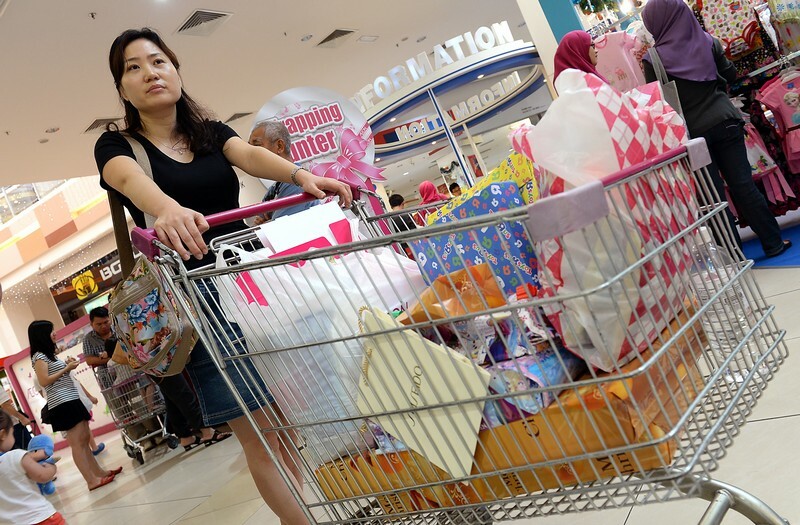 Throw in the school holidays, Christmas shopping and the weaker ringgit, and you have the reasons for so many Singaporeans heading up north to Malaysia. But that also means traffic snarls that can last three hours if you try to get through the Causeway. So how do you survive it? Madam Mazlindah Abdul Ma'moon, 44, said her family makes sure their iPad is stocked with movies and that their car has plenty of food and tidbits. Ms Mazlindah and her family, which includes three children aged 14 to 19, travel to Johor Baru weekly to shop and eat there. 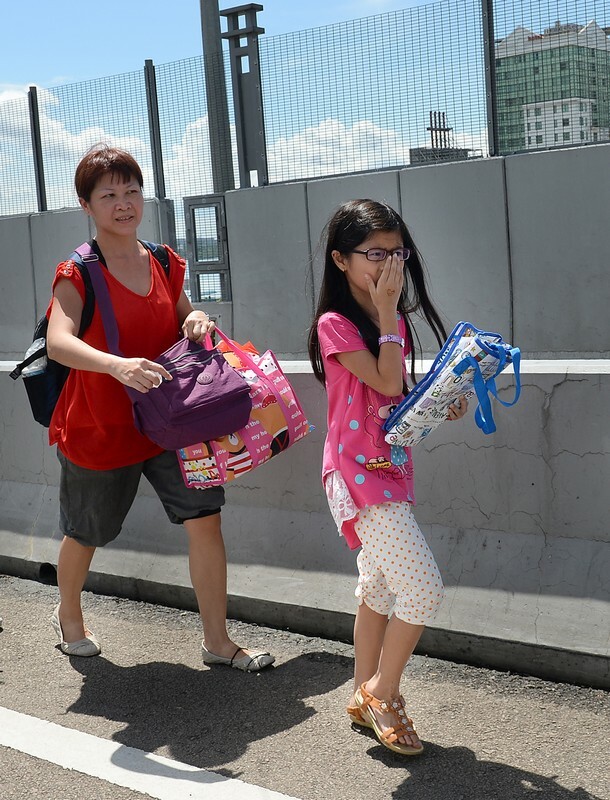 Technician Sumarni Kader, 39, was heading to JB with her family for their monthly shopping trip. 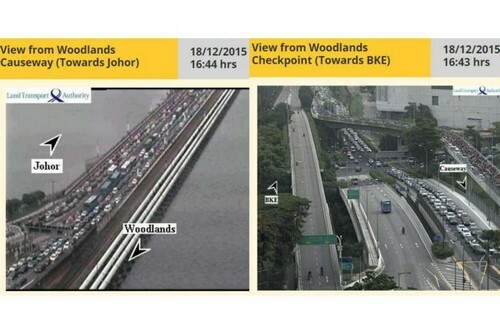 She said the average drive from that point to past the Johor checkpoint is about an hour. But judging from the jam, she was expecting a journey twice as long. Ms Mazlindah and her family say the hassle is worth it. "The journey in took us almost three hours and the journey back took almost two hours. But we managed to do everything we had set out to do," she said. Her family passes the time by playing games on their mobile devices and watching movies on the car's DVD player. 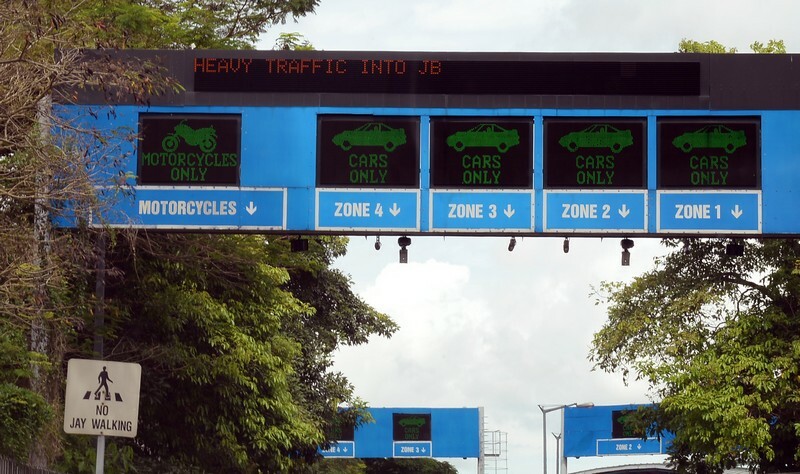 The TNP team finally passed the Johor checkpoint three hours after we had reached Woodlands Avenue 3, where the jam had started. Drivers are not the only ones affected by the jams. Bus passengers also face huge crowds at the bus stops. 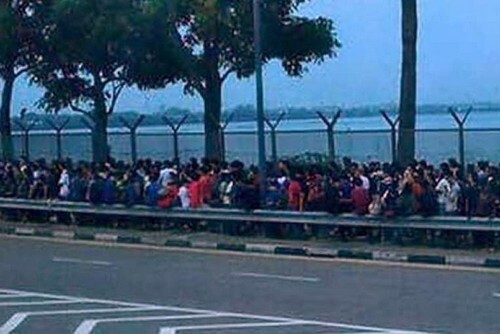 When it is really bad, some abandon the wait for a bus, preferring instead to walk across the Causeway. A 45-year-old technical manager, who wanted to be known only as Mr Faran, was one of the many who chose to go on foot. "It takes so long to board a bus that walking into JB is actually a much better option," he said. 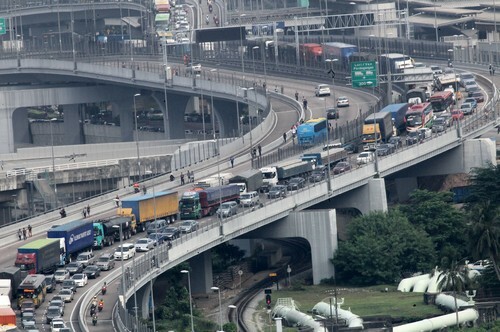 There were also traffic jams on the roads leading back to Singapore. 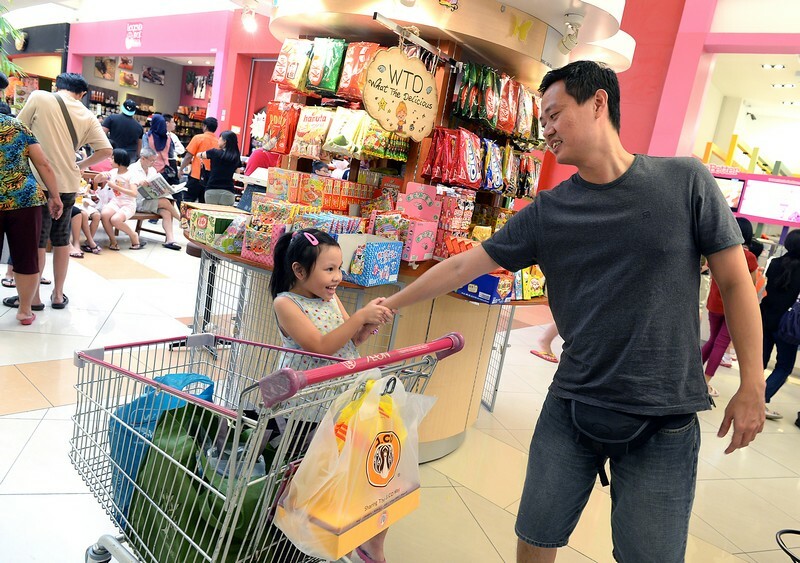 How popular is JB as a shopping destination? 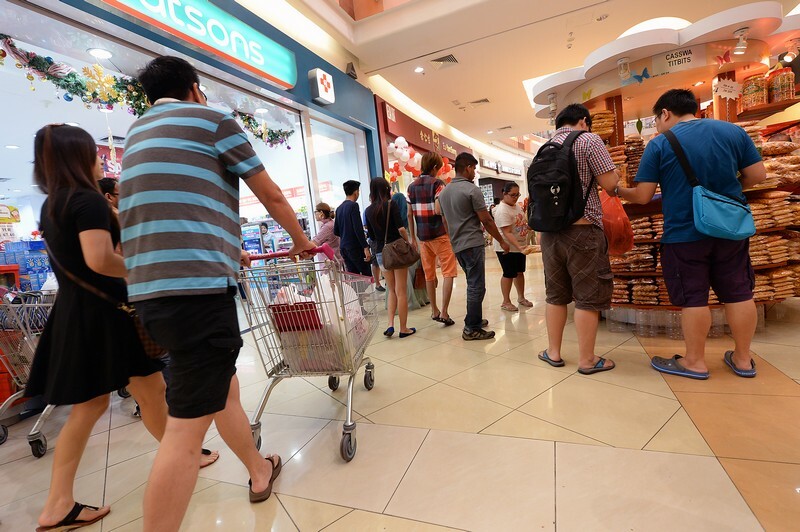 The Straits Times reported that Singaporeans make up 40 per cent of the 27 million people who visit Johor Bahru City Square each year. 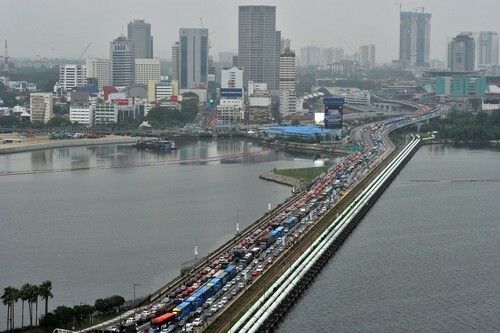 The mall is the closest in Johor Bahru to the Causeway. 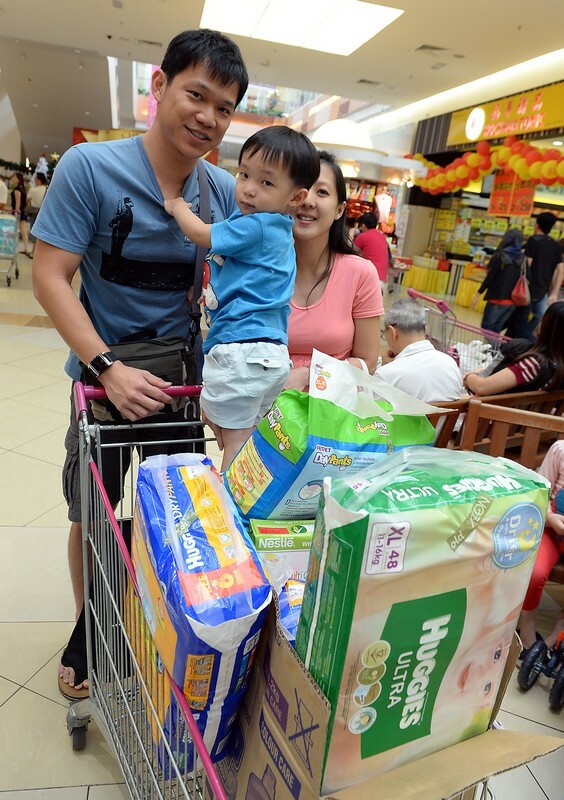 Mr Edward Leong said that despite the long jams, some everyday items, such as diapers, are much cheaper in JB. 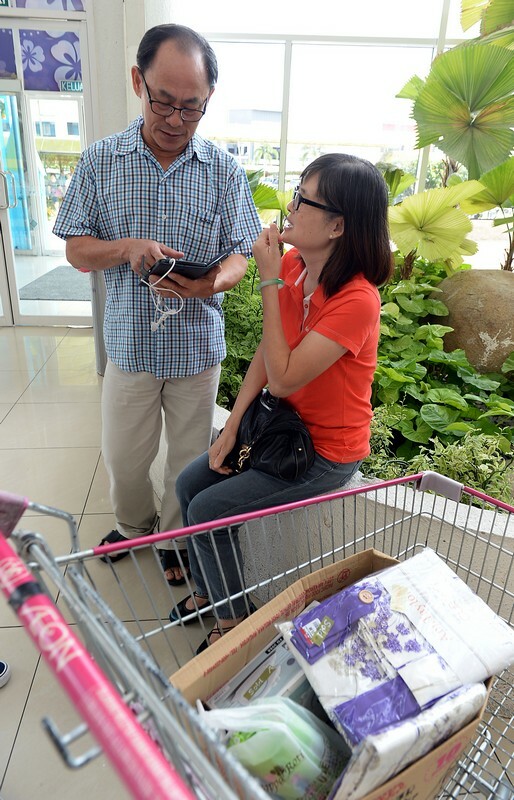 IT engineer Tony Fun (right) travels to Johor Bahru twice a month to visit his in-laws. Mr Seto (left) travelled to Johor Bahru at 3am on Saturday morning to avoid the jam. But for others, the trip is simply too time-consuming. 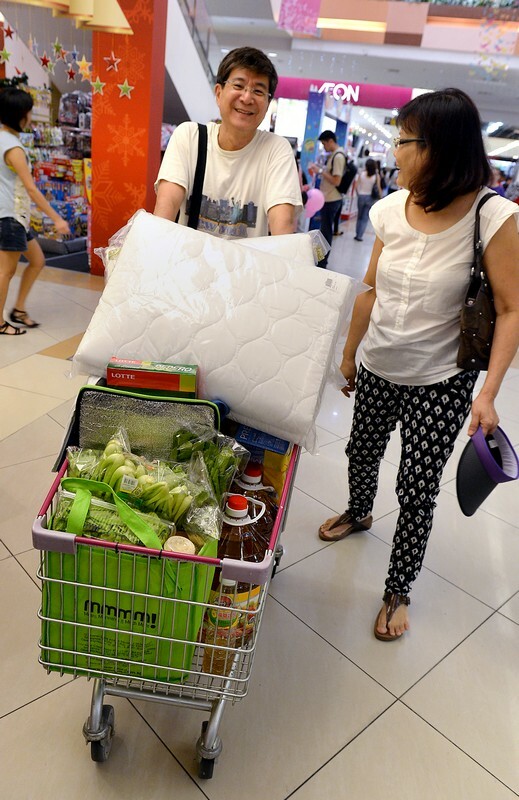 Mr Ang (drivers seat) said that he and his family goes to Johor Bahru every week for shopping. 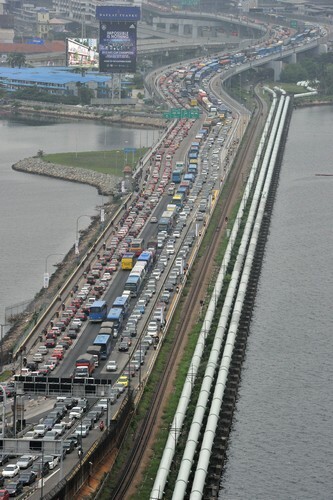 People walking across the Causeway to Johor Baru.